The above mileage is overstated because my GPS track got hinky over the last 15 or so miles of my ride. Still, I estimate that I rode about 135 miles today—my longest day on the tour so far, and I hope my longest day of those yet to come. Despite the distance, I’m feeling surprisingly good, apart from being very tired—a bit spacey even—and some residual hotfoot on the ball of my left foot. I got rolling about 30 minutes later than I intended this morning. But Perry and Lep had made me a nice breakfast, and I was enjoying visiting with them. I was a little reluctant to get going, even though I knew I’d be racing the sunset from the word go. They had told me I had a nice day of cycling ahead of me, and indeed, the first 70 miles really were nice, with mild hills, good pavement, and a lot of tree-shaded roads. The sky was very cloudy, and while it wasn’t very cold, it took a long time to really warm up. At one point I made a wrong turn, which chewed up about four miles. I cursed myself as soon as I realized my mistake. After that 70-mile point, the road got a bit rougher and I found myself in a more remote area, with much less population. At one point, I turned onto a road and it instantly felt like a different place. Partly because the sun had burned through the clouds, but also because the vegetation along the road had changed. What had previously been a solid carpet of grasses was now scrubby plants with dirt showing in places. The tall skinny pines were replaced with lower, broader ones. The area was remote enough, and reassuring road signs scarce enough, that I started worrying I had gotten onto the wrong road. I hadn’t. Pushed on to Bogalusa, the last town in Louisiana I’d see. This was my fallback, in case I didn’t think I could make my target of Poplarville MS. Checking my time and my average speed, I decided I had barely enough time. I pushed on. 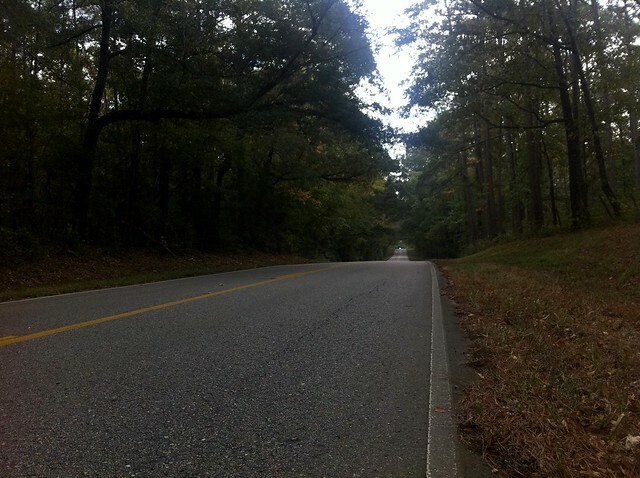 I crossed into Mississippi a few miles later, and found myself om a busy two-lane highway with a rumble-strip along the edge and a minimal shoulder, so I had to ride in the lane. The official ACA route quickly took my off that road onto sinuous back roads that looked like they would add at least five miles compared to staying on the highway, which was a straight shot into Poplarville. I chose the fast road over the scenic route, reasoning that I wouldn’t be able to enjoy the scenic route in the dark. While I made it to the town of Poplarville with the sun still over the horizon, my Warm Showers hosts for the night were a few miles past town. As I continued, it was getting dark enough that I decided it would be a good idea for me to have my lights on. By the time I did get to my hosts, Steve and Tanya, the lights were all but necessary. When I got to the gate of their home, I saw a warning sign of a dog biting a hand, so rather than push my way in, I phoned. Steve came out momentarily, accompanied by four dogs, three of whom were ready to kill me with kindness, the other being indifferent. Steve was starting to think I wouldn’t make it. But he had made me a pizza, which I inhaled, and he followed that with some of Tanya’s gumbo and a beer. So I feel pretty well refueled. This entry was posted in Daily report on 18 October 2010 by adamrice. Done for the day in Poplarville MS. About 130 miles today—longest yet. Tired but in surprisingly good shape.